I am an assistant professor of statistics (promotion to associate professor effective September 1, 2019) at The University of Texas at Austin. I am with the Statistics Group in the Department of Information, Risk, and Operations Management (IROM) at the McCombs School of Business. I am also a core faculty member in the Department of Statistics and Data Sciences (SDS) at the College of Natural Sciences. I received my Ph.D. from Duke University in 2013, Master's from the Chinese Academy of Sciences in 2008, and B.Sc. from Nanjing University in 2005. My Ph.D. advisor was Dr. Lawrence Carin. My research lies at the intersection of Bayesian statistics and machine learning. I am interested in statistical theory and methods, hierarchical models, Bayesian nonparametrics, statistical inference for big data, and deep learning. I am currently focused on advancing both statistical inference with deep learning and deep learning with probabilistic methods. I will serve as an Area Chair for NeurIPS 2019. I will be promoted to Associate Professor (with tenure), effective September 1, 2019. "ARM: Augment-REINFORCE-merge gradient for stochastic binary networks," co-authored with Mingzhang Yin, is accepted for publicaiton in ICLR 2019. My collaborators and I are presenting six papers in NeurIPS 2018 that cover a diverse set of research topics, including "Nonparametric Bayesian Lomax delegate racing for survival analysis with competing risks" with Quan Zhang from UT McCombs, "Dirichlet belief networks as structured topic prior" with He Zhao, Lan Du, and Wray Buntine from Monash University, "Deep Poisson gamma dynamical systems" with Dandan Guo, Bo Chen, and Hao Zhang from Xidian University, "Bayesian multi-domain learning for cancer subtype discovery from next-generation sequencing count data" with Ehsan Hajiramezanali, Siamak Zamani Dadaneh, Alireza Karbalayghareh, and Xiaoning Qian from Texas A&M University, "Masking: A new perspective of noisy supervision" with Bo Han, Jiangchao Yao, Gang Niu, Ivor Tsang, Ya Zhang, and Masashi Sugiyama from University of Technology Sydney, Shanghai Jiao Tong University, and RIKEN, and "Parsimonious Bayesian deep networks" by myself. NSF proposal "Collaborative Research: Combinatorial Collaborative Clustering for Simultaneous Patient Stratification and Biomarker Identification" is funded by the Information Integration and Informatics (III) program. I will serve as an Area Chair for ICLR 2019. I will serve as a member of the Senior Program Committee (SPC) for AAAI-19. "Semi-implicit variational inference," co-authored with Mingzhang Yin, is accepted for publicaiton in ICML 2018. "Inter and intra topic structure learning with word embeddings," co-authored with He Zhao, Lan Du, and Wray Buntine, is accepted for publicaiton in ICML 2018. "A dual Markov chain topic model for dynamic environments," co-authored with Ayan Acharya and Joydeep Ghosh, is accepted for publicaiton in KDD 2018. I will serve as an Area Chair for NIPS 2018. 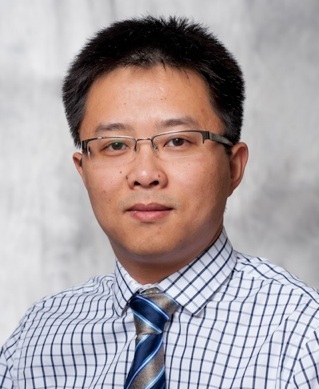 "Permuted and augmented stick-breaking Bayesian multinomial regression," co-authored with Quan Zhang, is accepted for publicaiton in Journal of Machine Learning Research. "WHAI: Weibull hybrid autoencoding inference for deep topic modeling," co-authored with Hao Zhang, Bo Chen, and Dandan Guo, is accepted for publicaiton in ICLR 2018. "Nonparametric Bayesian sparse graph linear dynamical systems," co-authored with Rahi Kalantari and Joydeep Ghosh, is to appear in AISTATS 2018. "BayCount: A Bayesian decomposition method for inferring tumor heterogeneity using RNA-Seq counts," co-authored with Fangzheng Xie and Yanxun Xu, is accepted for publicaiton in Annals of Applied Statistics. "Multimodal Poisson gamma belief network," co-authored with Chaojie Wang and Bo Chen, is accepted by AAAI 2018. "Nonparametric Bayesian negative binomial factor analysis" is accepted for publication in Bayesian Analysis. The paper "Deep latent Dirichlet allocation with topic-layer-adaptive stochastic gradient Riemannian MCMC," coauthored with Yulai Cong and Bo Chen, is accepted by ICML 2017. The paper "BNP-Seq: Bayesian nonparametric differential expression analysis of sequencing count data," co-authored with Siamak Z. Dadaneh and Xiaoning Qian, is accepted for publication in Journal of the American Statistical Association. R code will follow soon. Using the gamma/beta negative binomial process, we remove sophisticated ad-hoc pre-processing steps commonly required in existing algorithms. Please take a look at our paper and code if you are interested in differential expression analysis of sequencing counts. I will serve as an area chair for NIPS 2017. Aaron Schein did a full oral presentation for our collaborative work in NIPS2016 at Barcelona: Aaron Schein (UMass-Amherst), Mingyuan Zhou (UT-Austin), and Hanna Wallach (MSR-NYC)," Poisson–Gamma Dynamical Systems," Neural Information Processing Systems, Barcelona, Spain, Dec. 2016. 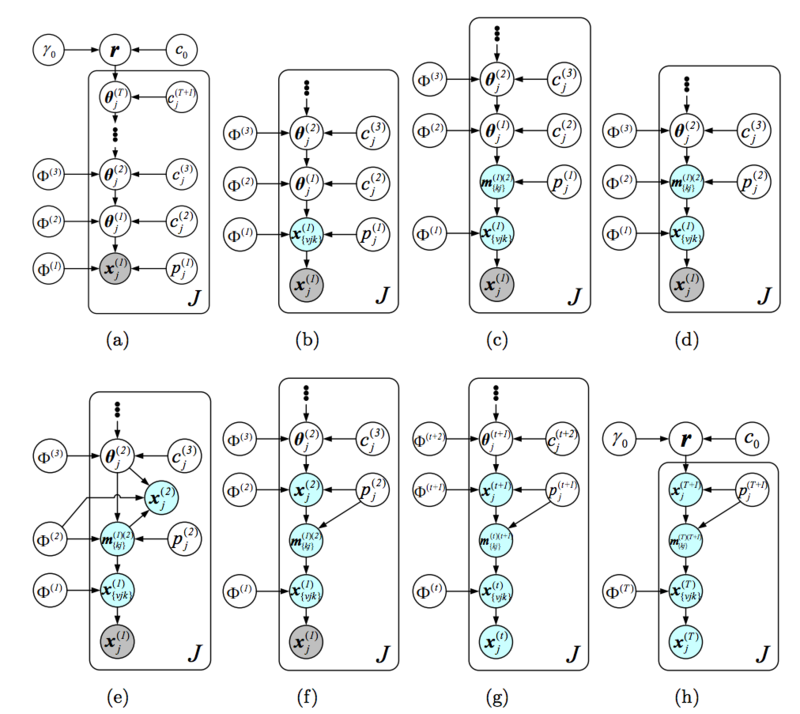 The paper "Augmentable Gamma Belief Networks," co-authored with Yulai Cong and Bo Chen, is now published in Journal of Machine Learning Research. Matlab & C code for "Gamma Belief Networks" is now available in Github. The graphical models shown below illustrate the hierarchical model and inference via data augmentation and marginalization across multiple hidden layers. Aaron Schein is presenting our collaborative work in ICML2016 at NYC: Aaron Schein (UMass-Amherst), Mingyuan Zhou (UT-Austin), David M. Blei (Columbia), and Hanna Wallach (MSR-NYC)," Bayesian Poisson Tucker decomposition for learning the structure of international relations," International Conference on Machine Learning, New York City, NY, June 2016. Matlab code for our JASA paper "Priors for random count matrices derived from a family of negative binomial processes" is now available in Github. Our NIPS2015 paper "The Poisson gamma belief network" presents a Poisson-gamma-gamma-gamma... generative model that can be used to unsupervisedly extract multilayer deep representation of high-dimensional count vectors, with the network structure automatically inferred from the data given a fixed budget on the width of the first layer. When applied to deep topic models, the Poisson gamma belief network (PGBN) extracts very specific topics at the first hidden layer and increasingly more general topics at deeper hidden layers. Jointly training all the layers is simple and the code is easy to implement, as a PGBN of T layers can be broken into T subproblems that are solved with the same subroutine, with the computation mainly spent on training the first hidden layer. The extracted deep network can also be used to simulate very interpretable synthetic documents, which reflect various general aspects of the corpus that the network is trained on. The paper "Priors for random count matrices derived from a family of negative binomial processes" is accepted for publication in Journal of the American Statistical Association. Infinite edge partition models for overlapping community detection and link prediction. Nonparametric Bayesian factor analysis for dynamic count matrices. My NIPS2014 paper "Beta-negative binomial process and exchangeable random partitions for mixed-membership modeling" introduces a nonparametric Bayesian prior to describes how to partition a count vector into a latent column-exchangeable random count matrix, whose number of nonzero columns is random and whose each row sums to a fixed integer. Note that in topic modeling, one is essentially trying to partition a count vector, each element of which is the total length of a document, into a Document by Topic latent count matrix. A fully collapsed Gibbs sampling algorithm naturally arises from the latent count matrix prior governed by the beta-negative binomial process. The paper "Priors for random count matrices derived from a family of negative binomial processes" that I co-authored with O.-H. Madrid-Padilla and James Scott defines a family of probability distributions to generate infinite random count matrices, whose columns are independent, and identically distributed (i.i.d.). 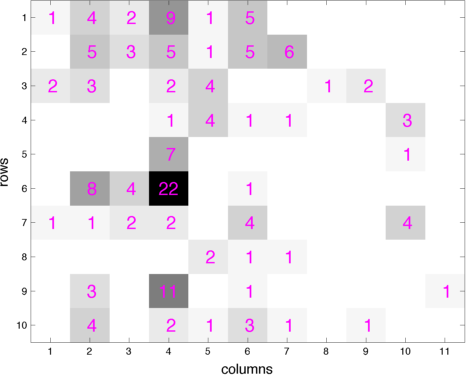 A random count matrix, with a Poisson distributed and potentially unbounded random number of columns, can be generated by either drawing all its i.i.d. columns at once or adding one row at a time. Both the gamma- and beta-negative binomial process random count matrices can model row-heterogeneity with row-wise parameters, whose conditional posteriors have closed-form expressions. 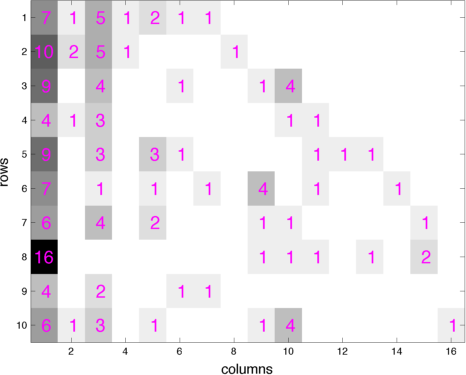 The left (right) picture below shows a gamma (beta) negative binomial process random count matrix, whose rows are added one by one, with the new columns introduced by each row appended to the right of the matrix. Our models lead to nonparametric naive Bayes classifiers that do NOT need to predetermine a finite number of features that are shared across all the categories. The paper "Negative binomial process count and mixture Modeling" that I co-authored with Dr. Larry Carin will appear in IEEE Trans. Pattern Analysis and Machine Intelligence: Special Issue on Bayesian Nonparametrics. The picture below describes a useful bivariate count distribution discovered in the paper.